WP eMember plugin allows you to customize the fields that appear on the registration and edit profile page. You can choose to not display some of the fields depending on your site’s need. The “Registration Form Fields” section in this menu page (see screenshot below) allows you to turn on/off certain fields from the registration page. You can also make certain fields required. The “Edit Profile Form Fields” settings section allows you to configure fields that you want to show in the edit profile page. If the default fields offered in eMember is not enough then you can add custom fields to the registration and edit profile form to collect extra data required for your business. 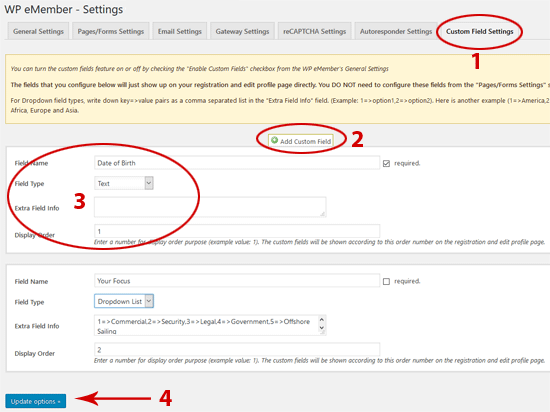 Go to the “Custom Field Settings” tab (from eMember settings menu) and configure the extra fields that you want to add. After you hit the “update options” button the extra fields will show up in the “Registration” and “Edit Profile” form on your site. Note: the custom fields you add will show up on your registration and edit profile page directly… you don’t need to configure these fields from the “Pages/Forms Settings” section. Need More Custom Field Control? We have an advanced eMember addon that has more custom fields controlling options. @Julie, Yes. Your users can log in using a username and password with this plugin. I need a membership plugin that will allow for a unique username or membership ID number to be used instead of an email address. Many of my members have family members and they all share the same email address, which is a problem on these membership plugins that only allow for the email address to be the username. Does this plugin allow for a unique member ID or username instead of an email to login into the membership site? Remember, the configured fields will show up on your registration and edit profile page directly. You don’t need to configure these fields from the “Pages/Forms Settings section. I purchased eMember plugin, added a custom field called WorkshopCode. I cannot seem to find it to in Registration Form Fields admin screen to add it to my page. Any Help would be appreciated. Sweet! Thank you soooo much — on my way to purchase now! Hey, can you tell us potential customers when your update will be available? Really want to purchase this plugin, but I need to be able to customize the registration page. Came across your site through a google ad and finally this is one plugin that makes me excited because for once it doesn’t use the default WP register/login page. That being said, I need my forms to be highly customized.. I see that your last comment mentioned this would be taken care of. Any update on when this feature is available? @Rhain, we are adding a feature which will allow the admin to add custom fields to the registration form. The new version of eMember will go live in a few days which will have this option. 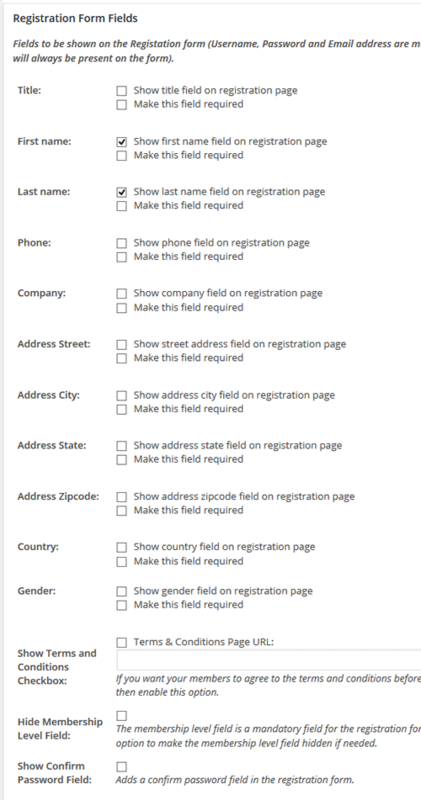 Is it possible to add additional fields to the registration form (i.e. suite number, rent/own, etc.)? Are you just trying to display whoe the referrer is (when used with the WP Affiliate plugin) for the current visitor? I am using WP eMembers – Settings v5.3.3 and I dont see this menu.